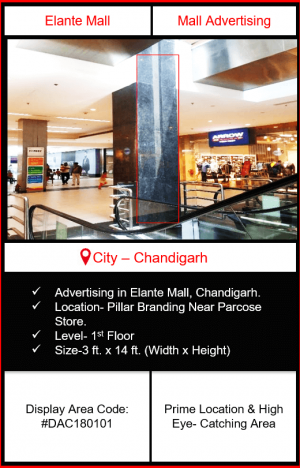 Lower Ground Floor Branding: The Lower Ground Floor have different retail outlets like Pantaloons, Metro sports Fitness Super Store & the Main Source attracting visitors on Basement is “BIG BAZAR”. 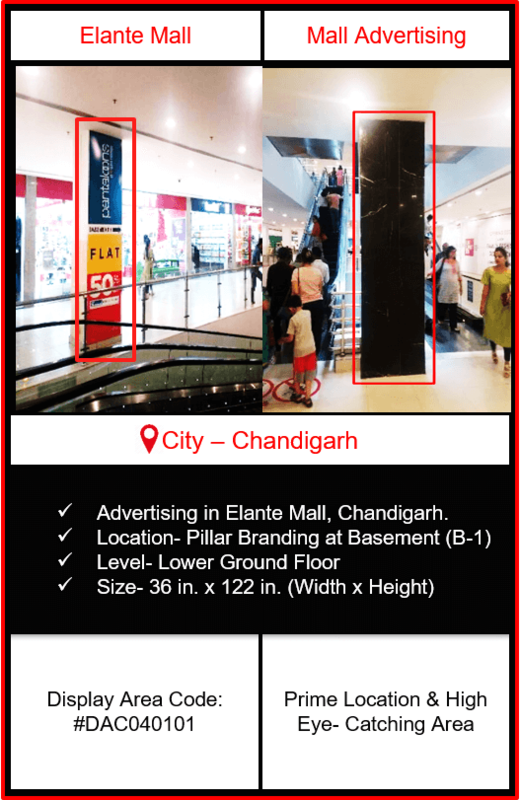 Usually, there is a regular visit of families in Big Bazar for weekly shopping. The Branding options on Lower Ground Floor are provided after taking into consideration the huge footfall visiting the floor. 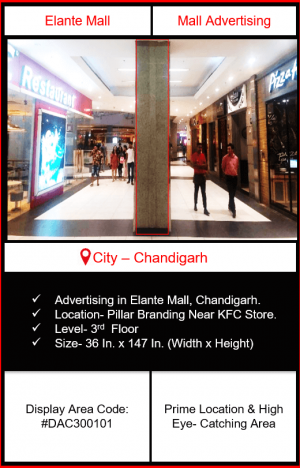 Ground Floor Branding: Ground Floor of Elante Mall is the Place which can’t be ignored, that’s why this floor is the Prime Branding area which usually costs very high and always in demand. 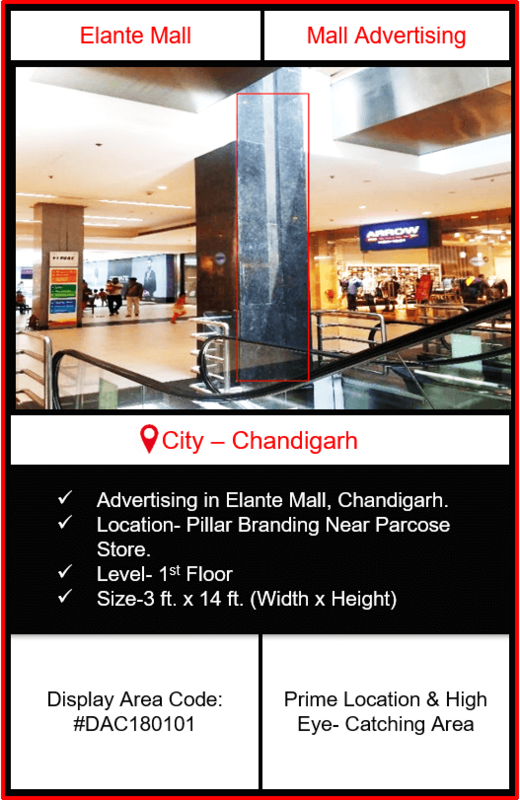 On the Ground Floor, there is a Courtyard, Main Atrium. 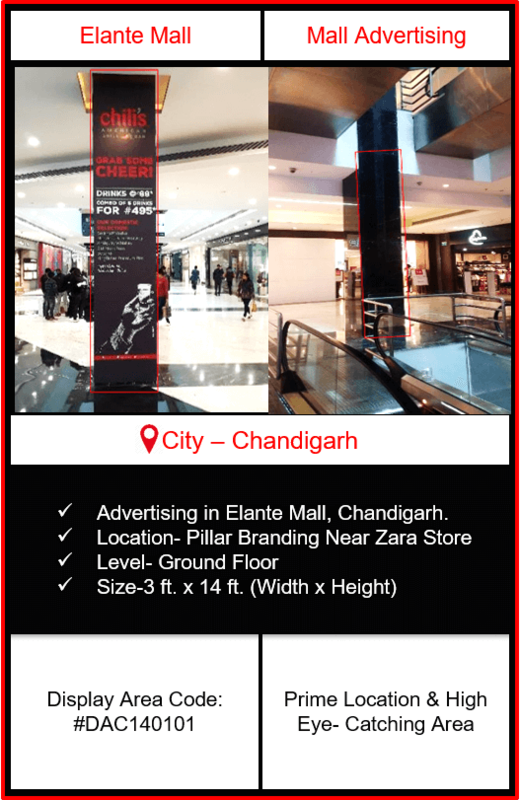 80% of people visiting Elante Mall, Chandigarh enters from the main gate at Ground Floor. 1st Floor Branding: The First Floor is the One place where we can shop for formal wears, Footwears & Bags, Sports Wear, Electronics, Watches & Eye-wear. 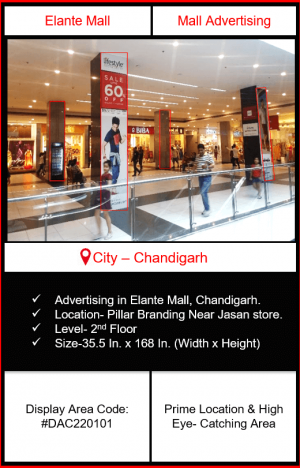 And Moreover, it is the place to shop for Cosmetic & Skin Care as well as western wear. This is the main Point to attract female target market. 2nd Floor Branding: Second floor of Elante Mall is special for the presence of Cafe Coffee Day, jewelry stores, Furnishing & Home Decor & Electronics Gadgets. Spa & Saloons are also available on this floor. 3rd Floor Branding:3rd Floor is the Top floor of Elante Mall but still almost 100% People visit this floor despite the fact that this is the Last floor. 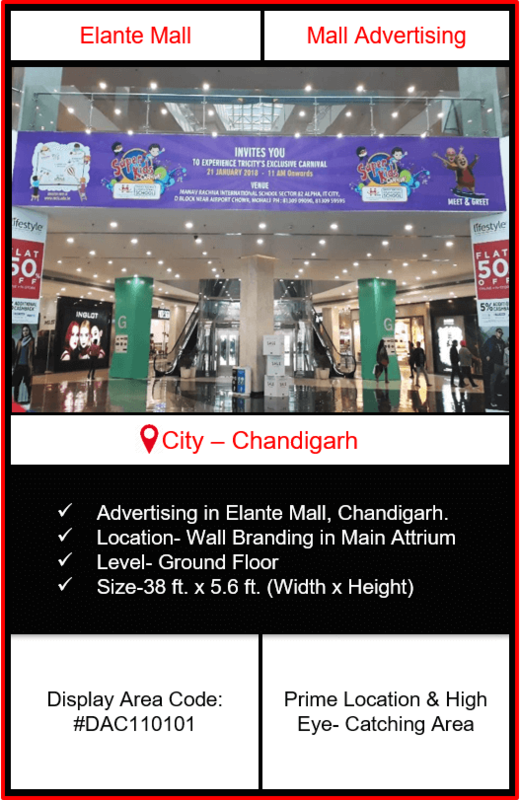 The main reason behind this is the Presence of Food Court, Blu-O, PVR Cinemas, Fun City for Special Kids Party & many special restaurants. 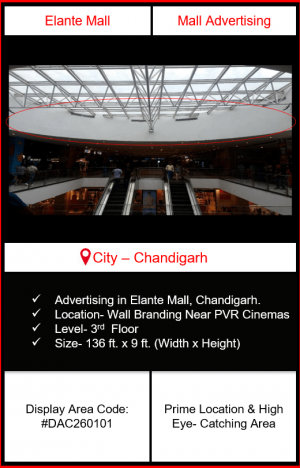 Third Floor is totally dedicated to family entertainment as it is providing all the necessary services like Food, Cinemas, Pubs, Food Court, Restaurant, Bowling & much more to spend a quality family time. 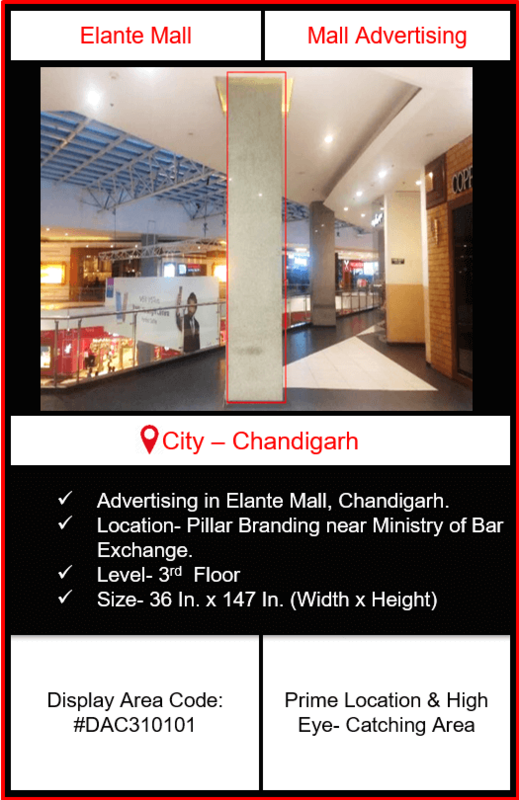 Food Court is the main point of attraction on this Floor to target around 8 Lakh Captive footfall. 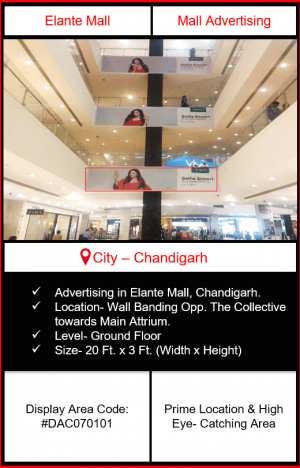 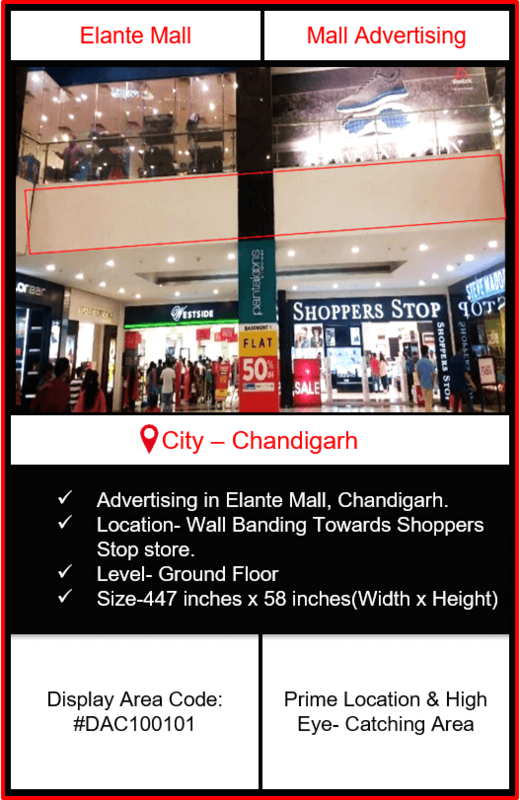 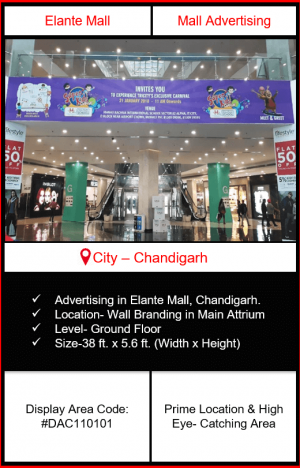 There are Various Advertising options dedicated to targeting the Huge Captive Footfall that spends at least 1 Hour in Food Court, Elante Mall, Chandigarh. 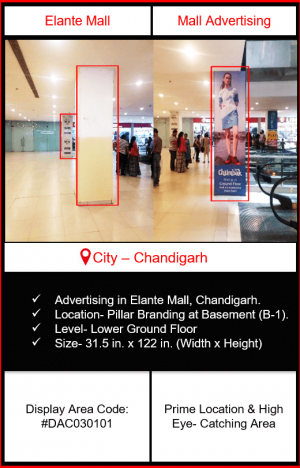 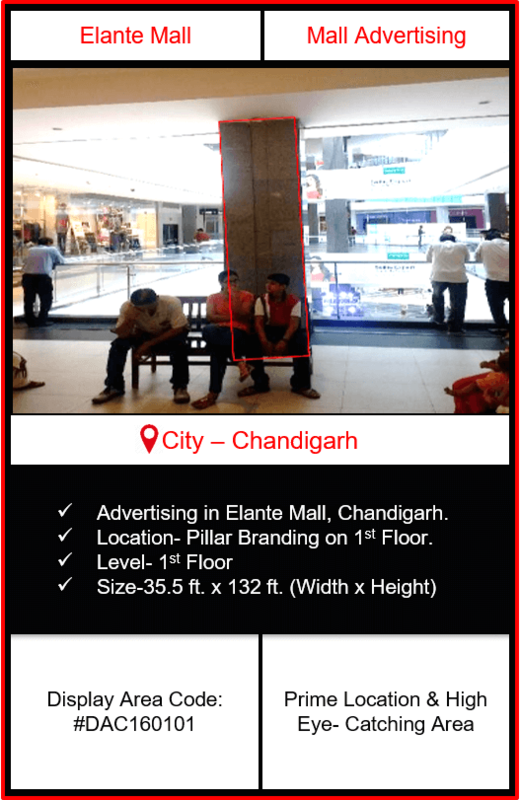 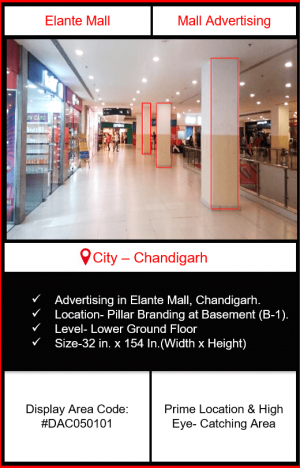 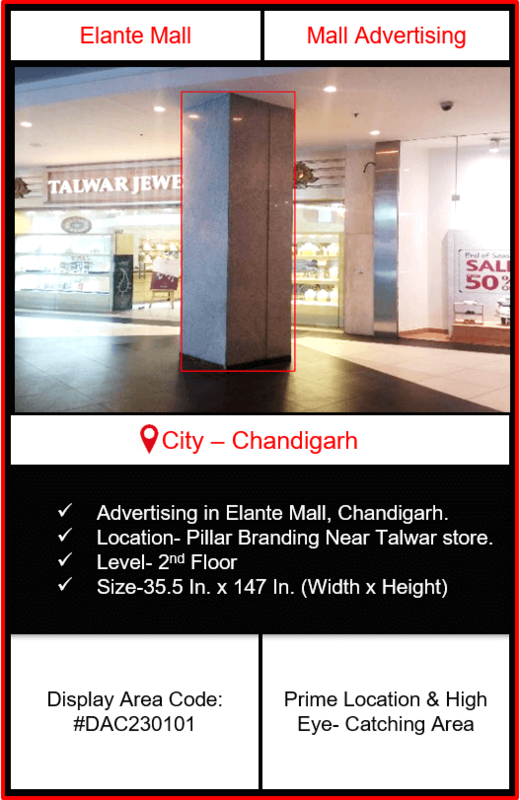 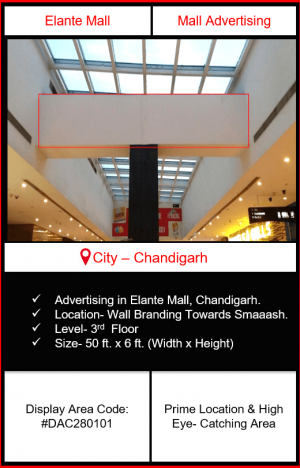 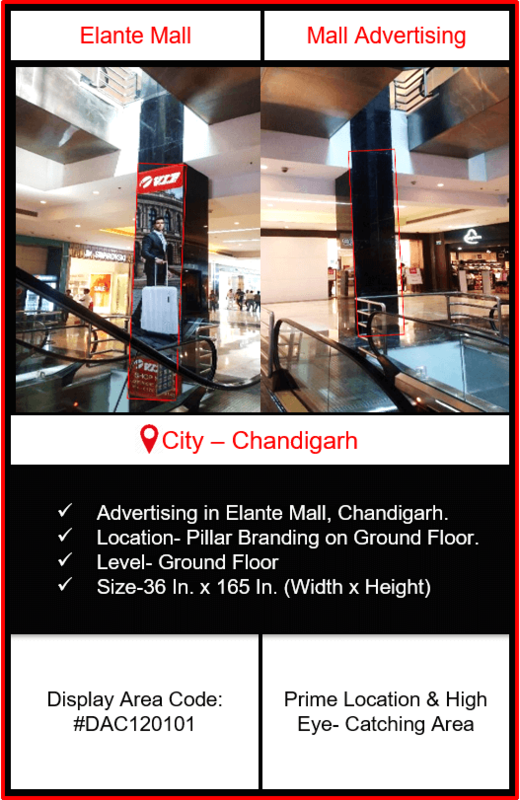 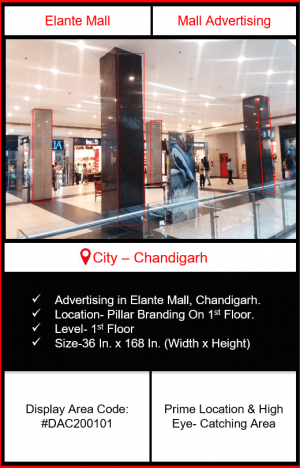 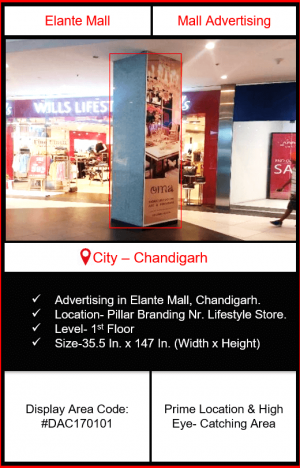 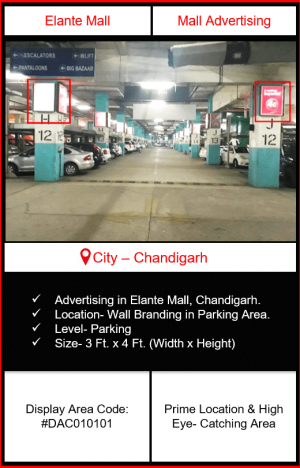 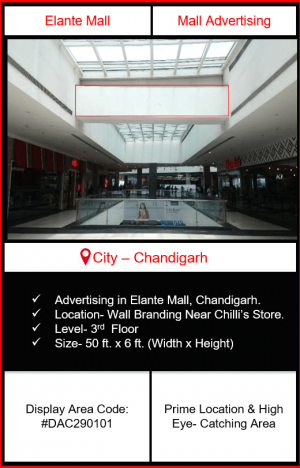 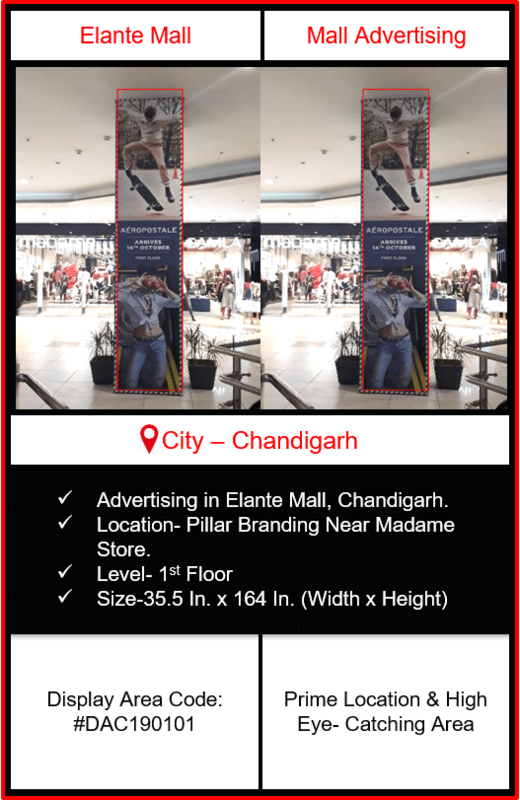 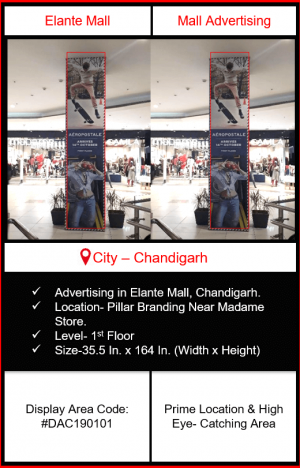 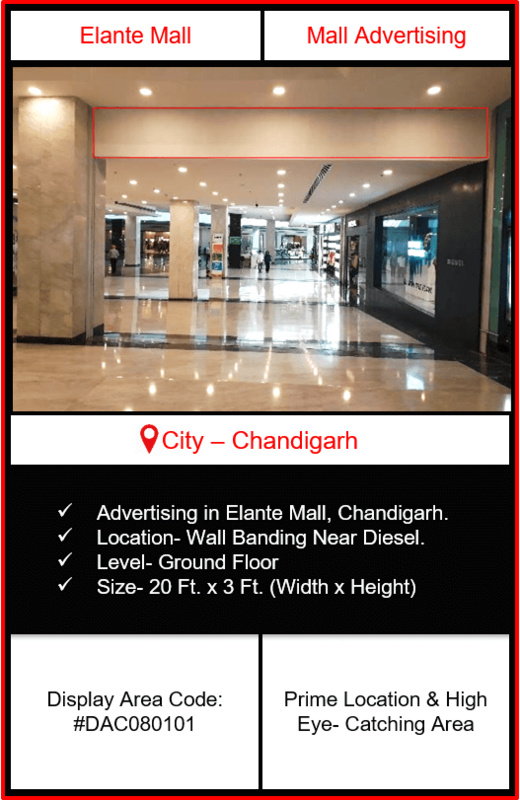 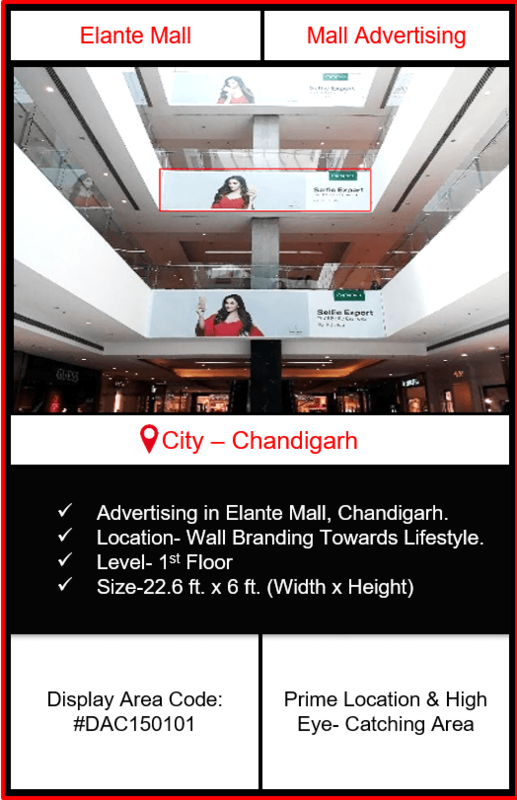 Why advertise in Elante Mall, Chandigarh? 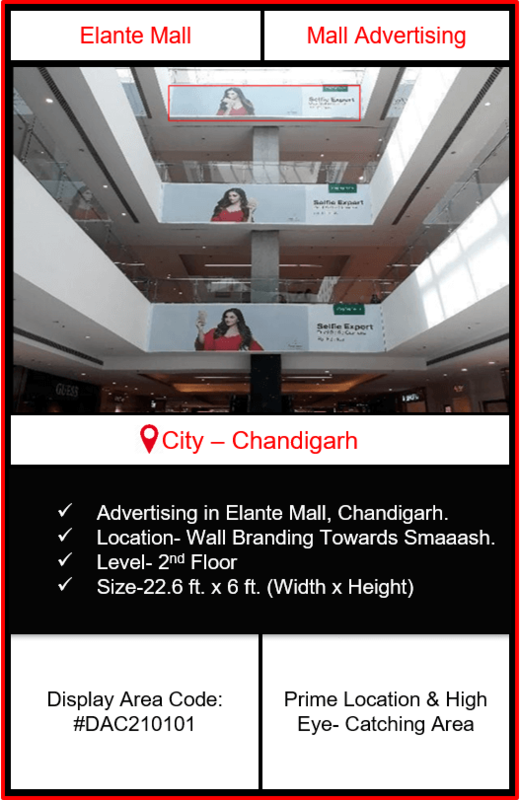 Elante Mall is one of the largest and most crowded Malls in India. This is the third largest mall in India, and when we talk about Malls in North India, Elante Mall has given the 2nd Most prominent place having retail space of over 1 million sq. 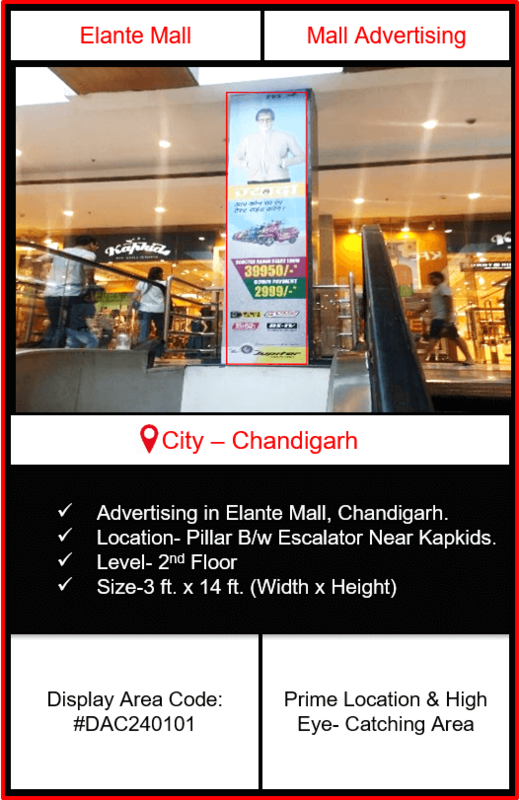 ft. Elante is the one stop shop for people seeking National as well as International brands. 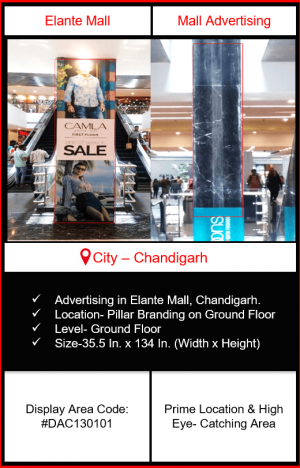 Top-most national and international brands reside here under the same roof along with a proper mix of the hypermarket, departmental stores, Sports Bar & much more. 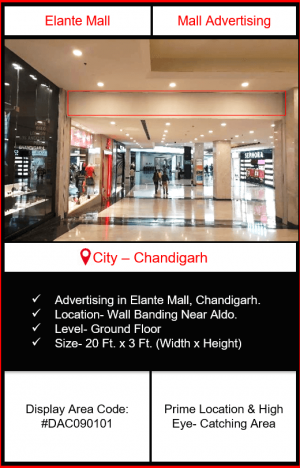 Retail mall, Office complex & Hotel with the central courtyard are the three distinct facilities that this development provides to its customers. 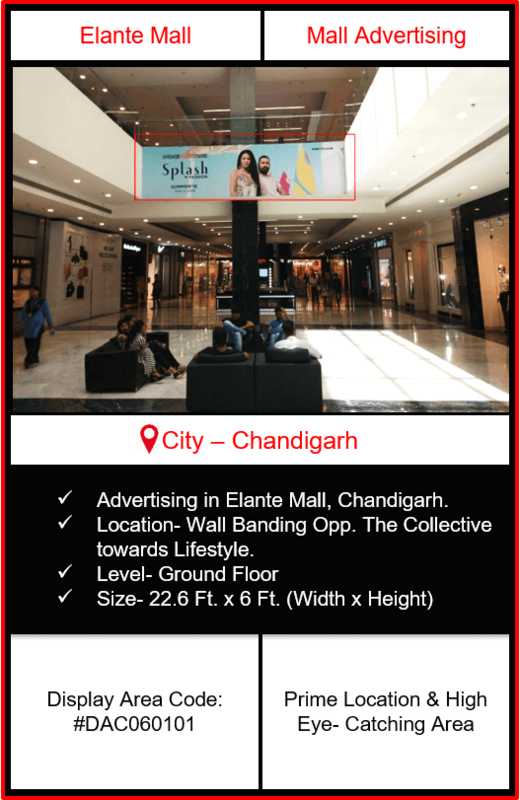 Elante Mall is the place providing Shopping Space, Kids entertainment as well as a Perfect place for spending a quality time with Family and Friends, which makes it the most crowded place of Chandigarh Tri-city. 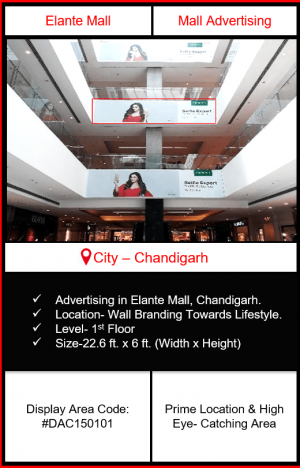 Elante is the best mixture of Business, Stay and Entertainment, the 3 pillars which every company or individual seek for in such kind of strong development project. 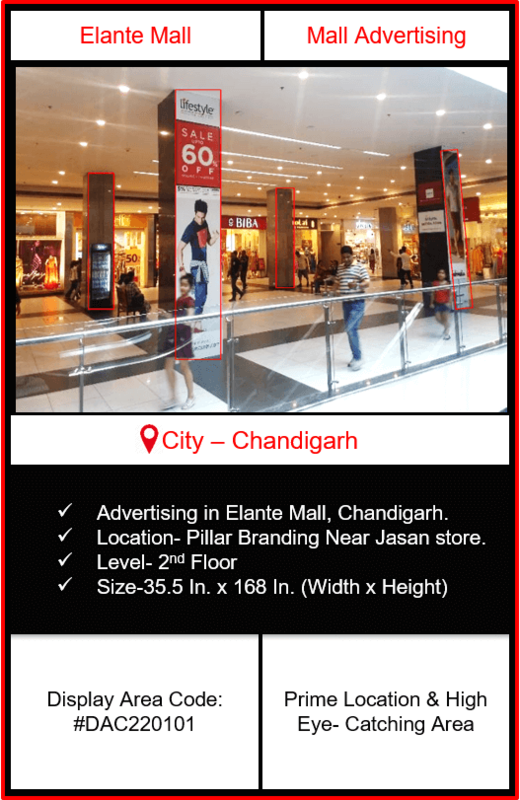 Elante Mall is spread across 20 acres & is located in Chandigarh, most acknowledged as ‘The City Beautiful’. Elante Provides strategical & well-established entertainment zones, multiplex, and food court to cater to its customers of various age groups. The volume of visitors in Elante is astronomically high i.e. More than 12.5 Lakh Per month, which makes it a Perfect place to advertise. 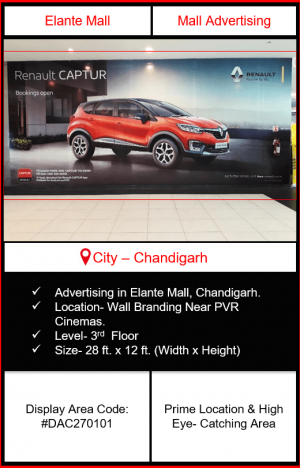 The 2 BIG LED Screens in Food Court is just like Brand Booster for Advertisers which takes entertainment to the supreme level for the Crowd visiting Elante Mall. 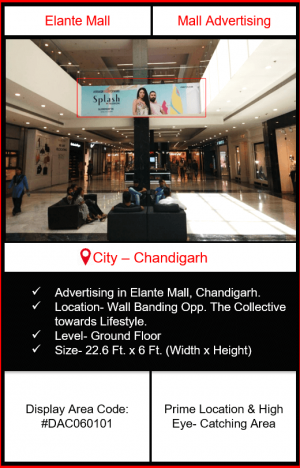 The mall witness a mammoth footfall every day which keeps the development the most happening place in the Tri-city. 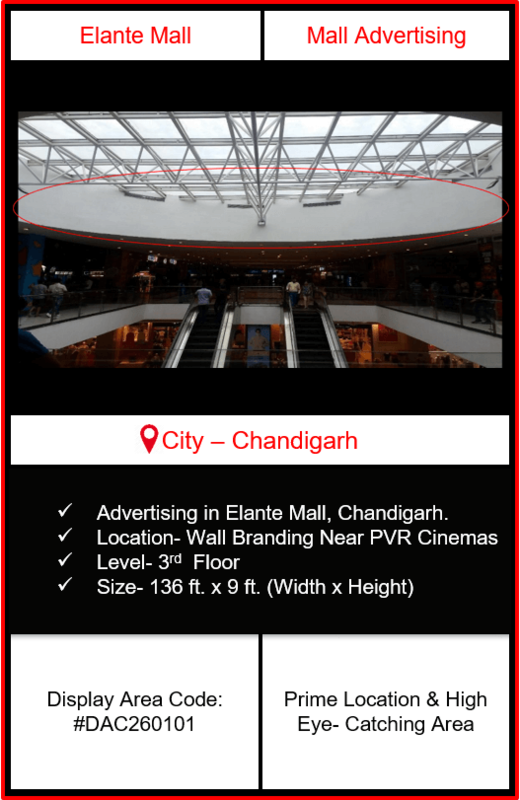 Hence, concluded as a must preferred location for the advertisers seeking to cater a huge crowd to give their brand a great visibility. 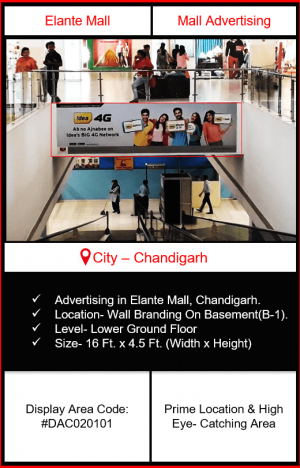 The Duration of the above-mentioned Campaign is 30 Days i.e. 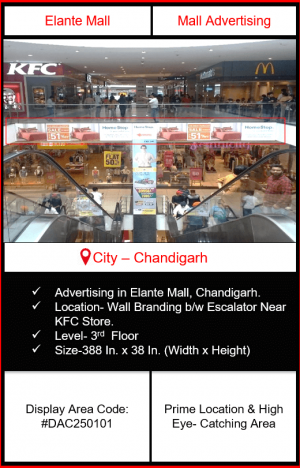 1 Month. The Client/Service Provider undertakes and warrants that the booking commitments shall not be postponed or canceled without the mutual consent of the parties. 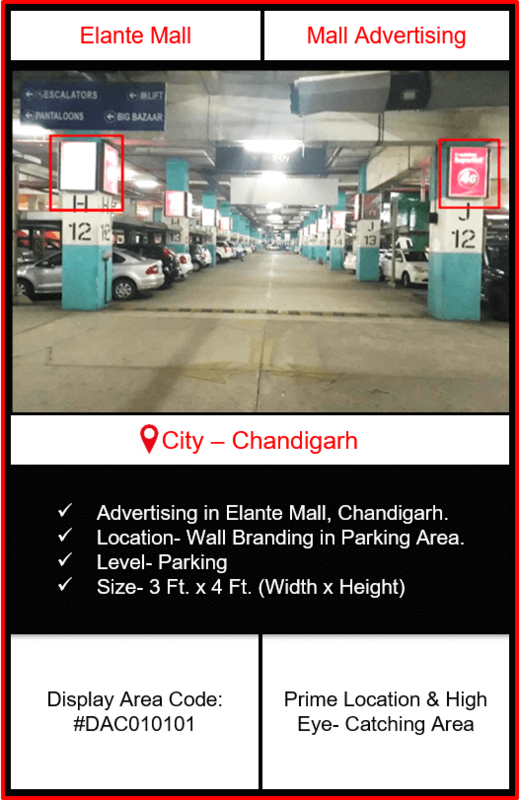 Campaign once locked can’t be stopped in between and the media taken can’t be changed or canceled. 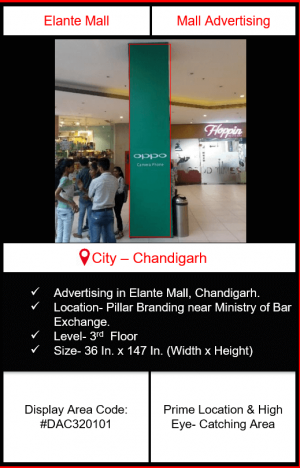 The client undertakes and warrants that nothing contained in the advertisement enrages the public sentiment; constitutes a Monopolistic/Restrictive and/or unfair trade practice; violates any other legislation for the time being in force or is made to give negative publicity of any other product. The client further declares and affirms that nothing in the advertisement infringes the copyright or any other right of any third party and there are no claims, actions or proceedings, pending or threatened, affecting the advertisement or the title thereof.